A hardy herbaceous perennial that has a lengthy history as a medicinal herb, and grown for its essential oil. This stunning plant is interesting alone, as a specimen plant, or in a group, with exuberant plumes of blossoms and bright green foliage. Its great for dry sunny spots and provides resources for many insects, some of which help to pollinate crop plants. 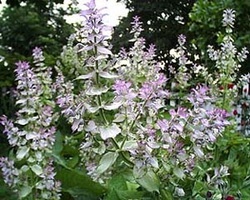 Its also noted to be good companion for beans, cabbage, carrots; the scent may repel pests and of course being from the Sage genus the leaves can be used for flavouring foods and drinks. native region: Southern Europe to Syria. native habitat:Rocky igneous slopes, mixed deciduous and coniferous woodland, shale banks and roadsides. Thrives on any ground that is not too wet. Plants can be killed by excessive winter wet. It is in flower in August, and the seeds ripen in September. The flowers are hermaphrodite (have both male and female organs) and are pollinated by Bees. Leaf:Leaves - raw or cooked. A strong, warm, aromatic taste and odour. They are used mainly as a flavouring in cooked foods. The leaves can be dipped in batter and cooked to make delicious fritters. Medicinal : anticonvulsive, antidepressant, antiphlogistic, antiseptic, antispasmodic, astringent, bactericidal. A ruderal plant taking advantage of bare soil and growing in very stony dry places. Can hybridize with Meadow clary if on same site.